We love when members of the GenderAvenger community make recommendations for the Avenger(s) of the Week! 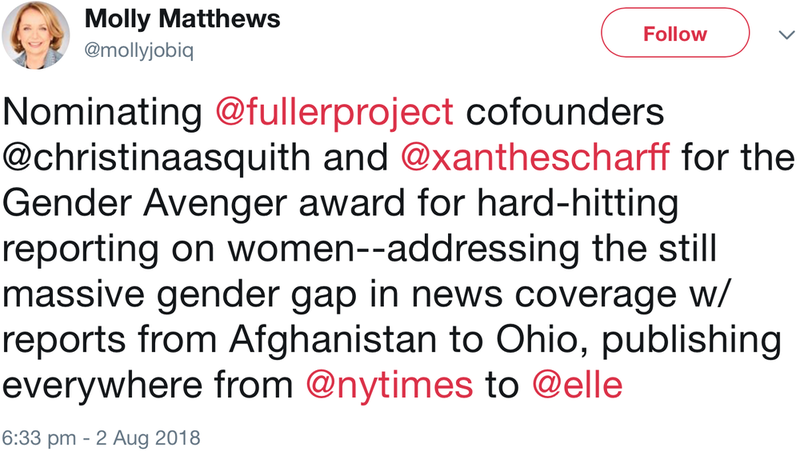 This week we heard from Molly Matthews, who asked us to recognize the Fuller Project for International Reporting founders, Christina Asquith and Xanthe Scharff. The Fuller Project is “a global team of journalists, photographers and filmmakers and researchers, dedicated to in-depth and independent reporting, with an emphasis on the traditionally overlooked and underrepresented role of women in media.” They produce stories for major publications that challenge the stereotypical portrayal of women as victims by featuring the women leaders on the front lines and taking a solutions-oriented approach. The Fuller Project also works with women’s leadership teams to amplify their voices and train women reporters from all over the world. Thank you, Molly, for introducing us to these incredible women.